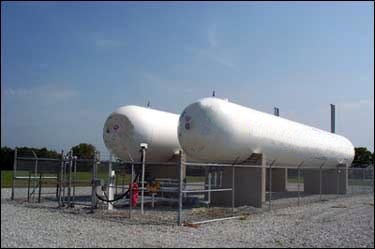 We are amongst the prominent names in the industry actively engaged in manufacturing and supplying a high quality range of Propane Storage Tanks. These tanks are manufactured with utmost proficiency by utilising the skills and intelligence of our professionals. The entire consignments are delivered in a stipulated time frame as per the clients' convenience and requirements. Since our inception in the year, 1984, we, “Kwality Pressure Vessels P. Limited” have carved a niche in the industry by offering an optimum quality range of Industrial Machines and Compressed Gas Storage Tanks. Under this range ,we offer Column Scrubbers, Heat Exchanger Machines, Pressure Vessels, Tipper Machines, Storage Tanks, LPG Storage Tanks, Propane Storage Tanks, Amonia Gas Storage Tanks and lot more. These industrial machines are produced in an advanced manufacturing unit equipped with high grade machinery, equipment, tools and technique. The entire range of products is manufactured to fulfil the diverse demands of the industry. We make sure to put in our best possible efforts in manufacturing these products as per the desires of the customers.